CUP FINAL REPORT: Farcet win the final 1-0 after losing the semi-final 10-0! Farcet United celebrate their Intermediate Shield Final win. Photo: RWT Photography. 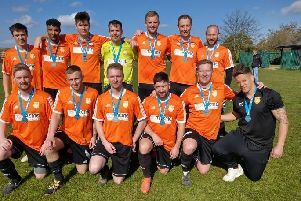 AFC Stanground Sports Reserves would have fancied their chances of Intermediate Shield Glory when Peterborough League Division Two title rivals Ramsey Town were thrown out of the competition for fielding an ineligible player after winning a semi-final 10-0. That enabled their victims, Division Three play-off chasers Farcet United, into the showpiece at Peterborough Northern Star’s Chestnut Avenue base (April 28). And despite a decent run of form going into the final, few gave Farcet a chance of springing a surprise. An 8-0 defeat was one prediction from a Ramsey man before the game. But a solitary Justin Pye goal early in the second-half, some heoric defending and terrific goalkeeping from Andrew Skeels ensured a dramatic result which pleased the Farcet Twitter operator. “So proud of the lads,” he said. “We were huge underdogs. It wasn’t pretty at times and we rode our luck.